1 l and 100 ml plastic bottles; 5 l can. Active against most of gram-positive and several gram-negative bacteria, as well as against mycoplasma and chlamydias. Uncommon tylosin tartrate resistance in microorganisms. Fast effect - therapeutic concentration is obtained even in 1-3 hours after administration. Long-term effect (up to 18 hours). Convenient oral administration with drinking water. The drug contains tylosin tartrate - 200 mg/ml (as an active ingredient) and lactulose (as prebiotic). Tylosin tartrate (a macrolide antibiotic) is active against most of microorganisms including Staphylococcus spp., Streptococcus spp., Clostridium spp., Corynebacterium spp., Pasteurella spp., Brachyspira hyodysenteriae, Chlamydia spp., Spirocheta spp. and Mycoplasma spp. The prebiotic selectively promotes growth and development of protective (beneficial) intestinal microflora: bifidobacteria (B.bifidum, B.longum, B.adolescentis, B.breve, B.infantis, B.pseudolongum, B.thermophilum, B.suis, B.asteroids, B.coryneform and others) and lactobacteria (L.acidophilus, L.casei, L.plantarum etc.). Due to prebiotic component, Tilosin AVZ provides strong antibacterial effect, promotes digestive improvement, fast recovery of intestinal epithelial cells and increase in bifidobacteria and lactic-acid-producing bacteria. 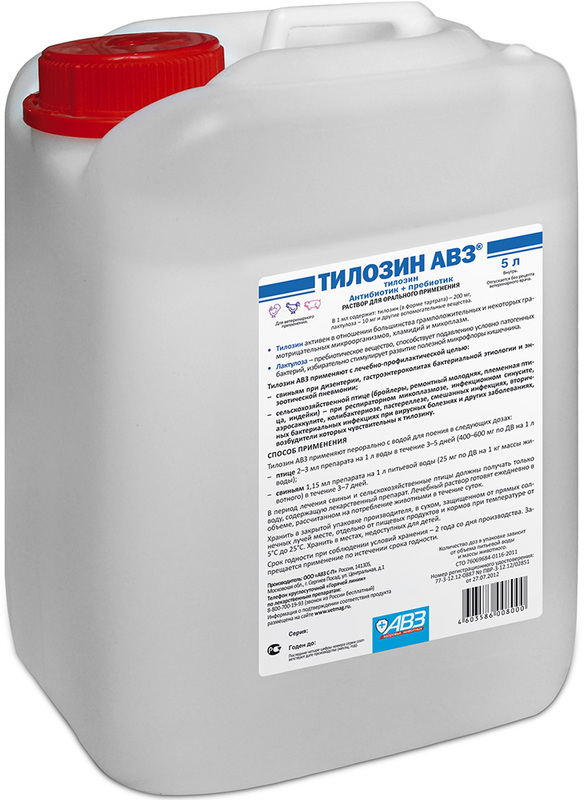 Prevents disbacteriotic diarrhea. Use in pigs with dysentery, bacterial gastroenterocolitis and enzootic pneumonia; in poultry (broiler chickens, replacements, breeding poultry, turkeys) with respiratory mycoplasmosis, infectious sinusitis, aerosacculitis, colibacillosis, pasteurellosis, combined infections, secondary bacterial ones associated with viral diseases and others, agents of which are susceptible to tilosin. 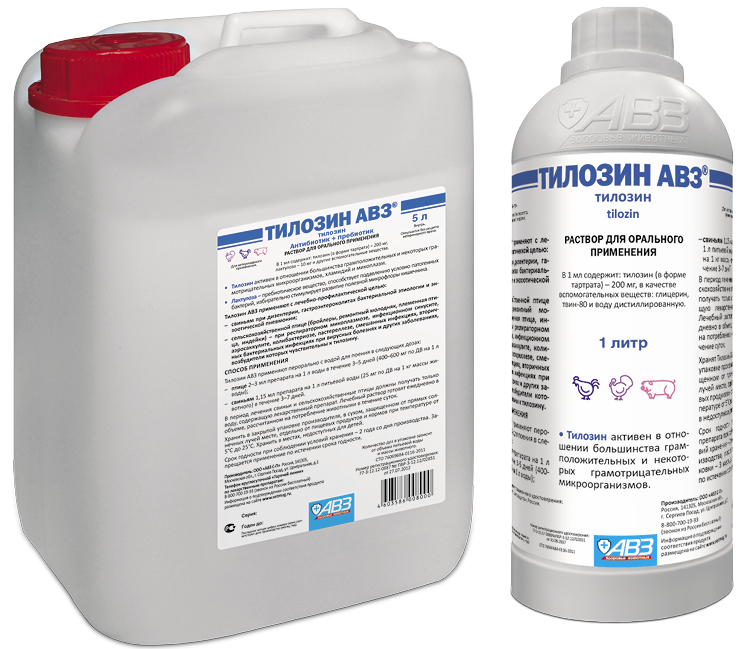 It is not allowed to use in combination with other antimicrobial preparations. Do not use in laying hens. • pigs - 1.15 ml per 1 l of drinking water (25 mg of active ingredient per 1 kg of body weight) within 3-7 days. Only water with the drug is allowed to be consumed during treatment. Prepare medical solution every day in volume aimed at daily consumption. Adverse events and complications are not generally observed in case of administration as per this package insert. Pigs and poultry are allowed to be slaughtered for meat not earlier than 5 days after the last drug administration. Store in closed original package. Protect from direct sunlight and moisture. Keep out of the reach of children and animals. Store separately from food and animal feeding at 5-25°С.